You may know this. Justin Bieber is a sixteen-year-old boy from Stratford, Ontario, Canada who sings (and dances, and writes songs). He is becoming rich with his singing. He is very popular, particularly with young girls, also with many women. He became famous first through YouTube videos, some of which go back to his earliest childhood. Then through the support of black singer Usher, and through touring the country and playing and singing acoustic on every possible radio station, working up from malls to mega-halls. Jun Chu's celebratory (promotional) documentary, Justin Bieber: Never Say Never (in 3D) leads up, ostensibly, to the moment when young Bieber sold out Madison Square Garden, in New York, the mark of a major pop entertainer. In fact, there is not much suspense about the success of this event, commercially, anyway. As it turned out, when tickets for a tour went on sale, "MSG," as Bieber likes to call it (perhaps not aware of the unwanted Chinese food additive) sold out in twenty-two minutes. There is nothing either exceptional or defective about this film, but you do not go to see it to judge its merits as a film. You go to find out what this kid is like and why he's popular, or if you're a fan, to thrill and cry and feel the glow. And there is a glow. Justin, "the Biebs," is charismatic. He is cute. He is upbeat, and has a charming smile. He exudes some of the squeaky-clean smiley radiance the young Donny had, of Donny and Marie Osmond, only he's a bit better looking and he isn't a Mormon. There is resilience, perkiness, and tremendous drive in the boy. Then there is the hair, which he flicks in a way that drives women wild. He was always a performer, posing with a guitar when he could barely hold one, good enough on a full set of drums to play a jazz concert at the age of twelve, mildly soulish in the twists and wavers of his voicings. And he is athletic, playing soccer and hockey as a kid, good except for an unwillingness to surrender the puck or ball once he got it; we see him sink some basketballs with apparent ease. He plays keyboards, some other instruments perhaps. But Justin Bieber turned into a phenomenon too soon to turn into a musician or singer or songwriter, and this happened because the Internet allowed him to bypass the Disney-style pop promotional machine, moving up to super-famous in a year and a half or two years when otherwise it would have taken many years. He worked with his own little team, independently, like a Canadian, but in America, once he had a manager. He'd have been eighteen, nineteen, twenty. Twenty-one, even! Instead it started when he was fourteen or so. Dates are unimportant. What's important is that he's going through puberty, a little late, and his voice is changing. Reports say that he got his voice coach, Jan Smith, "Mama Jan," to deal with that. It seems likely he'd have hooked up with Mama Jan anyway to deal with the challenges of performing over 80 times a year, and to get some voice training. He was born of a teenage mother and his parents split when he was two. He was raised by loving grandparents. This was not a wealthy family that provided a team of tutors. He went to the local school. He was sociable and he had (has?) friends. The film shows him reconnecting with them periodically. Though his new life leaves little time for that, those scenes show him at ease and having fun. He isn't one of those "artists" whose careers are fueled by loneliness or the dreams of an outsider. He just had talent and wanted to perform, and there were video cameras and there was YouTube. In fact some, in debunking this film, say you could get as much or better simply by watching all the videos of Justin Bieber on YouTube. That's unfair because here we get to hear from the Biebs in some detail, and get the usual breathless picture of the touring and performing life. 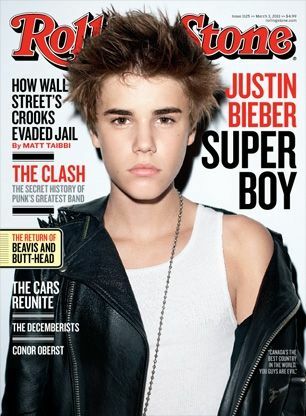 A Rolling Stone cover story, "Super Boy," reveals that the Biebs (no huge surprise) is not deeply informed. Fans will be thrilled, perhaps shocked, at the cover picture in which he wears a leather jacket, off the shoulder, over a white tank top, with pouty face rather than his usual smile, and -- spikey geled Corey Haim-ish hair! The author/interviewer, Vanessa Grigoriadis, recounts how she approached her subject (who arrived an hour late driving his Range Rover) feeling she was the luckiest woman in the world because she was a big fan/fantasist for/about him, but when she got in the car, she dropped her fantasy at once because she realized he is just a "child." Is he wary of having his childhood "stolen" pace Madonna on Michael Jackson? His manager Scooter Braun (young and clean-faced like Justin) recounts Biebs' hearing this and saying, "Don't let that happen to me." Or is he in fact being locked into childhood? Or did that happen to Jackson and is it the same thing? Anyway, Justin Bieber is revealed by Grigoriadis as a little short on actual knowledge. He doesn't read the paper, doesn't know about politics. He's against abortion, so far as he knows. He is reluctant to read chapters of the textbooks he's supposed to be studying. Anyway, he leads an odd life now but he is as close to normal as is possible under the circumstances. He is also rather short. He wants to grow taller. He needs to. It's also a question what his voice will sound like and how his fans will respond when it fully changes, because it is changing, and doesn't really have the timbre his fans fell in love with. Okay, that's about enough about Justin Bieber. Do not hate him. There have been much less talented people raised to sudden stardom. But his songs are pretty bland and he's no Michael Jackson either musically or in the dance department. As he says at the end of the Rolling Stone article, he doesn't feel powerful. He thinks his fans are powerful. "If they don't buy my albums, I go away." Smart kid.